Every day we discover something new about our small person as he develops and finds himself in the world. Lately a sense of independence has turned into fierce independence. Don’t try to feed him, he’ll do it himself thankyouverymuch. And don’t even try to touch something he has taken it upon himself to use/move/open/close/push he will push your hands away and say “nayh”. 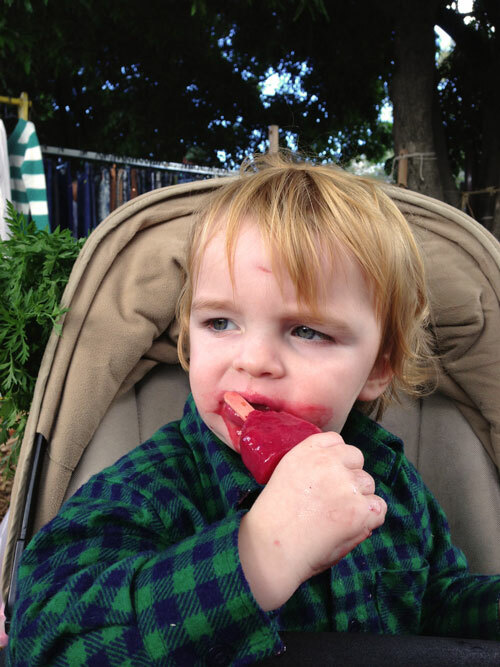 So he delighted in a treat* at the growers market today: his very own ice pop, a delicious Spiced Plum and Honey Yoghurt by Liana Raine artisan pops. *I’m a mean mummy and together with SAH we have decided that Bub can live without as much processed sugar as possible. He doesn’t eat junk food or chocolate or lolly pops but very occasionally he and I share an fancy ice pop at the markets as a treat.